The XP-50 is a premium rank III American twin-engine fighter with a battle rating of 4.0 (AB/SB) and 3.7 (RB). It was introduced in Update 1.31. Its excellent climb rate and acceleration make this plane great for energy fighting. 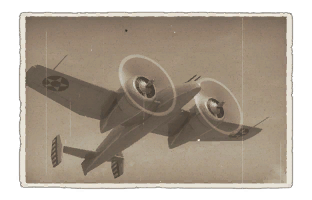 It won't be hard to get altitude advantage upon the majority of your opponents, which this plane can out-climb. Use your climb rate to be the highest plane of the battle: by wepping you should be able to climb at a 25 - 30° angle quite easily. Your priority targets are the highest enemies. If you notice you were out-climbed, don't hesitate to roll away and climb more as a dive is a risky trade with this plane. If an enemy climbs to catch you, make a 90° climb at full power and when they starts to stall, try to boom & zoom them. Use your acceleration and/or climb rate if someone gets on your six to lose them. 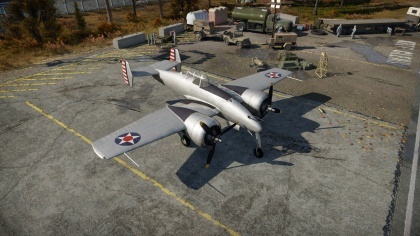 As a premium vehicle, all modifications are already equipped when purchasing the XP-50. Powerful weaponry, thanks to the two AN/M2 cannons. The engine quickly cools down if you idle the power. Overheats quite fast while using WEP. Manoeuvrability not as responsive during long steep dives. Hard to survive a engine fire.